Does Laser Therapy for Hair Growth Really Work? How do laser hair growth treatments work? You’ve probably heard about laser hair removal, but did you know that there’s evidence to suggest lasers can be used to increase hair growth and thickness, too? According to The Dermatology Times, androgenetic alopecia (AGA) — genetic hair loss — occurs in more than 35 million men and 21 million women in the United States alone, so it should come as no surprise that doctors are looking for new ways to correct baldness and increase hair growth. Commonly used to treat chemotherapy-induced alopecia, alopecia areata, and male pattern balding, low-dose laser therapy is a popular form of treatment for hair loss. The method utilizes photons, which are irradiated into scalp tissues and absorbed by weak cells in order to encourage hair growth. The procedure is a non-invasive and non-chemical option for hair loss performed in many hair restoration clinics around the world. Compared to supplements, topical treatments, and surgeries, lasers may seem like an amazing solution for stimulating hair growth. So, is there a catch to the procedure, or is it as good as it seems? While it is still not known how laser treatments work to stimulate hair growth exactly, the theory is that it encourages cell stimulation. This can produce many beneficial results. Early studies from the 1960s found that wounded mice treated with lasers experienced rapid healing due to microcirculation of the blood supply. Modern laser hair growth specialists believe that this increased circulation can be credited for encouraging hair follicles to produce hair growth, even if they were unable to before, through gentle stimulation. In one recent study, low level laser light therapy (LLLT) was found to improve a variety of non-scarring alopecias. It further demonstrated that this method can be used immediately following hair transplant surgery in order to improve healing and viability in the early growth of transplant grafts. Another study of 44 males aged 18-48 years old found that laser hair treatment provided a 39% increase in hair growth over a period of 16 weeks. That said, laser therapy yields inconsistent results. Modern laser hair growth treatments are generally difficult to measure, particularly because the treatment is relatively new. To date, no double-blind studies have confirmed the treatment’s efficacy. More research will be required before it can ever be widely accepted. Some specialists acknowledge that the treatment tends to work, but they still aren’t entirely sure why. The full effect of lasers on hair cells remains widely unknown. Although doctors are unable to agree on whether laser light therapy is an effective option for treating hair loss, there is a general consensus that the procedure is safe, tolerable and significantly less invasive than surgical hair restoration. The verdict on laser light therapy’s ability to stimulate new hair growth is that it seems to works for some people, and doesn’t for others. You can try laser hair therapy in a number of ways, either by visiting a clinic with special laser machines or by purchasing a hand-held device for home use. Specialists typically use laser therapy devices (often referred to as “laser hoods”, “laser helmets” or “laser caps”) with thousands of medical lasers, which are placed close to the scalp for 15 to 30 minutes per treatment. Compared to handheld devices that can be used at home, these machines provide significantly more laser power. They usually feature several panels with 100 or more laser diodes to treat various areas of the scalp at one time. These treatments can cost patients between $3,500 and $5,000 per year. There are some handheld devices — including laser hair growth brushes and combs — that claim to offer the same benefits. These devices emit lasers at wavelengths ranging from 630 to 670 nanometers, and are categorized as nonsignificant risk (NSR) devices. It’s generally recommended that these devices be used for 10 or 15 minutes at a time, two or three days per week. When compared with in-office laser hair growth treatments, at-home options are significantly more affordable. For example, the Advanced 7 Laser Comb costs just under $300. Should you decide to try an at-home laser hair growth product, make sure to choose one with FDA (Food and Drug Administration) approval. There are a number of hair growth procedures proven to be effective, including hair transplants — which include follicular unit extraction and follicular unit transplantation. Low-level laser therapy may blow these treatments out of the water in terms of benefits. Again, virtually no side effects — Because hair growth laser therapy is administered at relatively low levels for short periods of time, the majority of patients experience no side effects whatsoever. As the treatment is non-invasive, it comes with significantly fewer risks than invasive transplants. Regardless, you should always consult your physician before starting any new treatment. Increased hair strength — Specialists claim that this treatment not only encourages stimulation of new hair growth, but also improves the appearance and strength of existing hair. Some users report their hair is left thicker, softer, and fuller after treatment. Stops the progression of hair loss — Some clinics report that the majority of patients who try clinical laser treatment not only experience hair growth, but also a lower frequency of hair loss following treatment. Home options are affordable — People who receive hair transplants can pay up to $15,000 for a complete treatment. Laser therapy is by no means cheap, but still one of the more affordable clinical hair loss treatment options available, especially if you opt for at-home devices, which can be used for years for the onetime cost of the device. As with many cosmetic treatments, there are two sides to the story. Although low-level laser therapy appears to be gaining traction in the medical community, there’s still a number of issues with the procedure. For starters, whether it actually encourages hair growth is still uncertain. Plus, there are several pitfalls to the therapy when compared with other more proven methods. It’s time-consuming — Unlike traditional hair growth procedures, which are usually completed in one or two days, laser light therapy requires several sessions per week, and it may require up to four months before producing any noticeable results. Plus, low-level laser therapies for hair growth typically require that, for optimal results, you continue receiving treatment for the rest of your life – although some providers suggest you can also start tapering them off after the initial treatment. May not be effective in late-stage baldness or thinning — Studies show that laser therapy is significantly more effective in the early stages of hair loss. Therefore, it may not be a viable option for those in advanced stages of hair loss. Clinical laser treatments can be costly — Although at-home laser treatments may be an affordable option when compared to hair transplants and other costly procedures, clinical hair growth laser treatments can set you back several thousands of dollars a year, indefinitely. Although the technology is relatively new and there’s still some debate surrounding its efficacy, there’s little question specialists will continue to make advancements in the field. Laser therapy is not a miracle cure to hair loss, and there is no concrete evidence at this point to say that it even is a hair lose cure at all. Results vary from patient to patient, and the costs for in-office treatments remain prohibitive. Home treatment can be an effective and affordable way to manage hair loss. While not as reliable as in-office sessions, these devices cost roughly one tenth of the price. It is also worth noting that the following devices have all been cleared by the FDA. This device uses 12 low-level lasers to fight baldness at home. The cordless and rechargeable comb is lightweight for easy use. Results will begin to show after four months of using the laser comb for eight minute sessions, three times per week. With its nine lasers, this combcan be used both for correcting small bald spots and for full head treatments. 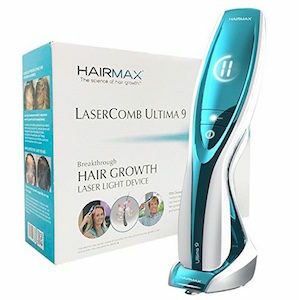 HairMax’s LaserComb comes with a charging stand and has a light up display to help users find the right setting. After using the device for roughly ten minutes, three times per week, some users have noticed results in as little as 13 weeks. 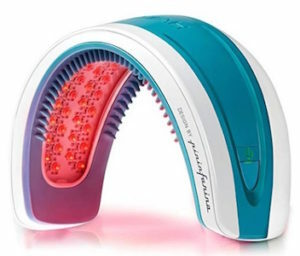 Another hair restoration device from HairMax is the LaserBand 82. Instead of combing over an area to treat it, this device sits on the scalp during use. Its 82 lasers evenly spread the band’s benefits across the head. HairMax guarantees satisfaction in five months or less, with treatments as short as 90 seconds, three times per week. 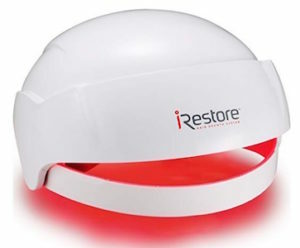 Like the LaserBand 82, the iRestore also sits on the head, allowing hands-free use. Its 51 medical grade lasers have been clinically proven to improve hair growth. When used every second day for 25 minute sessions, results should be visible within three to six months. 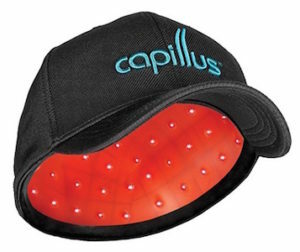 With its 82 lasers and a battery pack that allows wearers to move around during treatment, the Capillus is an effective and more stylish alternative to other similar devices. While you likely won’t be wearing it out on the town, the cap is sleek enough for many to comfortably wear in their backyard. Daily six minute treatments yield initial results after six months of use.